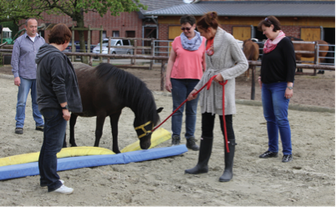 „Being a herd: Teamtraining with Horses“ was the titel of the training with horses that ANDRESCHAk.biz and Schröer Consulting carried out for the central office of a German Association of Service Organisations (KVD e.V.). The members of the team experienced the challenges of leadership and the differences in leadership behaviour, the importance of respect, trust and authenticity and learned to see and appreciate each others strengths. Collective Intelligence, augmenting knowledge and optimasing the benefit of networking were the topics of a very special evening event with the "Verband Deutscher Unternehmerinnen (VdU) Bocholt", a German Association of female entrepreneurs. 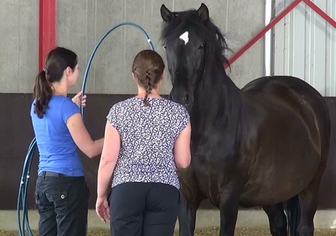 In this 3-hours workshop the horses showed very impressively the benefits of collective intelligence and short theoretical sessions helped to transfer the experience into daily business and networking activities. In June we participated in the "3. Deutschen Diversity-Tag", a day carried out by the "Charta der Vielfalt" when organisations start activities on diversity all over Germany. The Art of Leadership - Leadership Live Experience: An open seminar, that was carried out by ANDRESCHAK.biz and skills in motion at a beautiful place with beautiful spanish horses near Koblenz. Step by step the participants were introduced to the horses and worked with them on the following topics: personality, communication, personal leadership style and teamwork. Here you can watch the video!